Micah Brooks is a worship leader from Nashville, TN. 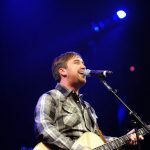 He is a songwriter, author, music coach and entrepreneur with a heart for the church. Helping people become better Christ followers is his passion. He has a beautiful wife and three cute kids. Visit www.micahbrooks.com for more. Advent means the arrival or coming of a notable person. It comes from the Latin word adventus. For Christians, the season of Advent consists of the four Sundays that precede Christmas Day. This is the celebration of the coming of Christ, born of a virgin and here to dwell among us. Each Sunday is accompanied by a theme.